This central apartment in Barcelona, right on the famous Paral.lel street, is a lovely home away from home. 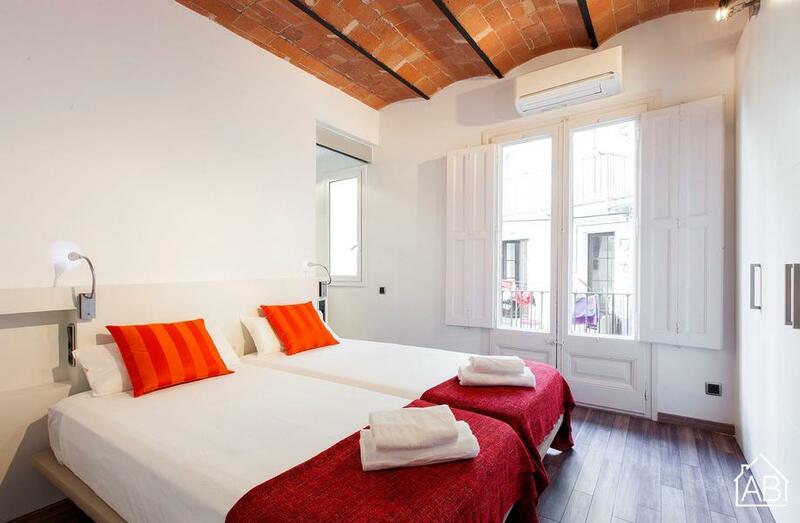 It is located in Poble Sec, an upcoming and trendy area of the city. Just five minutes away from Las Ramblas and the Port, and 10 minutes from Montjuïc, Plaça Espanya and the Fira de Barcelona conference center, you´ll have Barcelona at your fingertips. It is well connected to the rest of the sights in the city, with a metro station located just outside the building. From here you can reach Plaça Catalunya and Passeig de Gràcia in just 5 minutes, and by bus you can reach the beach in 5 minutes, too. There are also plenty of supermarkets, restaurants and bars nearby, as well as some popular theaters and clubs. The apartment is incredibly spacious and has been recently renovated. It has a modern style with updated furnishings and fittings. Guests can access the apartment via a card-reading system and it also has a video entryphone. It has 4 bedrooms and allows up to 10 people to stay here comfortably. One bedroom has two bunk beds allowing four people to sleep, and another has one double bed perfect for two more guests. In the third bedroom there are two single beds for another two people (unfortunately this room does not have windows), and there is a further double sofa bed for two more in the final room. The apartment also has a satellite TV with over 900 international channels in the dining room and in one of the bedrooms.